We all know someone who is still complaining about the UI changes made in iOS 7, but iOS 7’s growth has remained strong with the latest measurements from the App Store boasting that iOS 7 adoption just reach 80%. iOS 7 was the fastest adopted version of iOS when it landed this past Fall and jumped out with a 13% adoption rate on the first day alone. 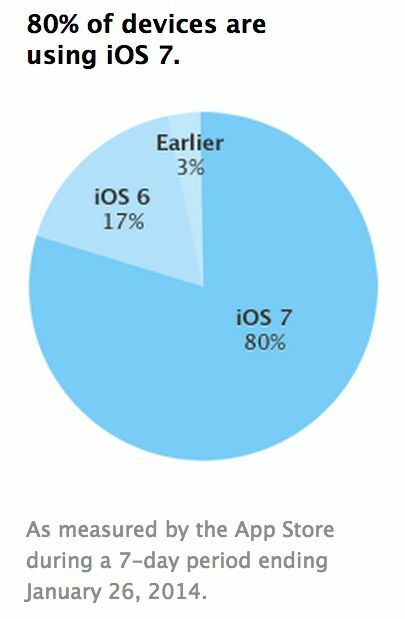 Last month Apple reported iOS 7 was stealing one percentage point of usage from iOS 6 per week, with 78% of iDevices running iOS 7. That growth is starting to slow though with iOS 7 now only gaining 2 points since December 30th 2013.
iOS 6 is still used on 17% of iDevices, but older versions of iOS now account for a mere 3%, down one point since December.